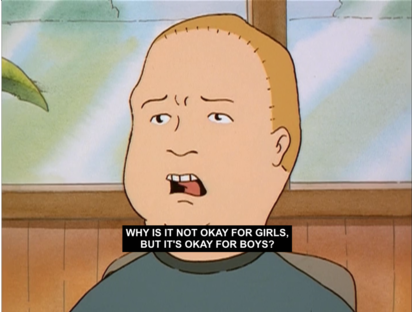 Well Bobby, that is a very good question. Why does the double standard exist? The age-old belief that men are more capable and more intelligent has cleared the way for centuries of sexism. Even now, in an era of rights for all, that old belief still rings. The way I see it, we were all created equal and we each have our own contribution to the world, so i find it completely unnecessary to have this double standard. Especially now, in high school, I know that there is this double standard in relationships. Guys are expected to get more out of the relationship, even if the girl gets called names when she gives the guy what he wants. Double standards drive me insane, and I can’t help but get angry and stick up to them every time someone decides to use a phrase that encompasses it. Down with the double standard!